Adi Shankara has described the Mantra given in this post as the Mantra, which contains the “Prapanch” of Creation. In the context of this Mantra, the word “Prapanch” means the manifestation of Creation. 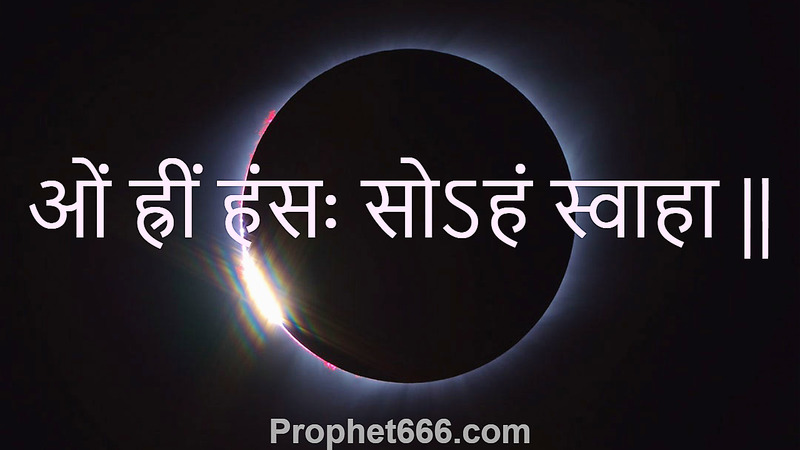 This Mantra has become most popular among spiritualists, mostly Western, who chant it as a Meditation Mantra to Meditate upon the Source of Creation. This Mantra comprises of Panch or 5 Mantras, which can be further divided and classified as an Ashtakshari or 8 Letters Mantra as shown below. Swa orस्व is the Atma or Soul of the Sadhak, which is is a sub-division of Parmatma or the Over-Soul. Ha or ह is Ahuti or Offering. The other Mantras, given above, which make up this Ashtakshari Mantra are individually most powerful Mantras to Meditate upon the Para Brahman or the Source of Creation. These Mantras need no further description because they have been described in depth in earlier articles and advances spiritualists need no introduction to these Mantras. Adi Shankara had also taught two specific kinds of very advanced Havan Vidhi and Nyasa for this Ashtakshari Mah Mantra. These are not actual Havans, but a kind of ritual to give Agni or infuse energy into the different energy centers or Chakras of the Kundalini Shakti. These Chakras are energized by 5 different Infusion Mantras, each of these 5 Infusion Mantras contain this Ashtakshari Mah Mantra along with Beej Aksharas of the Chakras. However, this is a very advanced Mantra Sadhana and hence suitable for advanced Sadhaks and Yogis of Kundalini Yoga. Other spiritualists and laypersons can safely Meditate upon the ओं ह्रीं हंसः सोऽहं स्वाहा || to come close to the Source of Creation. उसदिन लक्ष्मी साधक प्रातः लक्ष्मी ह्रदय स्तोत्र का पाठ करें ,तो शुभ होगा.वैसे इसका रोज पाठ करना श्रेयस्कर है .अथर्व रहस्य में दिए गए निर्देश अनुसार पहले नारायण ह्रदय का पाठ ,फिर लक्ष्मी ह्रदय पाठ और पुनः नारायण ह्रदय का पाठ किया जाता है .इसके आशातीत परिणाम निकलते हैं .